Special features in this park consist of a valley floodplain in IDFmw with large, old red cedars, cottonwoods, red-osier dogwood, devil’s club, oak fern and lady fern. Old growth Douglas-fir and pine grass are also a dominant part of this landscape. Another important aspect of this park is it’s low elevation talus slopes with rock outcrops and associated microclimates (ice has been reported in shaded hollows even in summer). A good place for birding. 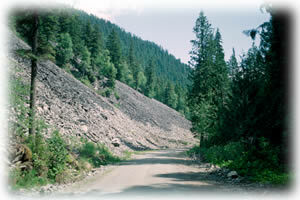 Removal of rocks from the talus slopes is prohibited by law. The park is located near the town of Little Fort, approximately 100 km north of Kamloops. The park may be accessed by gravel road off Highway 24, 15 km west of Little Fort. History: The park was created April 30, 1996 as a result of recommendations made in the Kamloops Land and Resource Management Plan. The park will be managed according to the Management Direction Statement for Eakin Creek Floodplain Park. Conservation: This park contains a valley floodplain with large old red cedar and cottonwood, and other bottomland species such as red-osier dogwood, devil club, lady fern and oak fern. Douglas-fir, pine grass, soapberry and mahonia find habitat on the north and south slopes. Extensive talus slopes contain ice caves and rock outcrops. Eakin Creek provides habitat for wild stocks of rainbow trout. Wildlife: Well-established wild trout stocks are found in Eakin Creek. The old-growth trees provide habitat for a variety of cavity-nesters including bats; as well, warblers and American dippers are found here. There is no viewing platform but there are wildlife viewing and nature study opportunities.